Ever since Mike Macfarlane finished his very underrated career with Kansas City in 1998, the Royals have shuffled through a lot of different starting catchers (21, to be exact), trying to find somebody – anybody – who’d prove himself capable enough to handle the job over the long haul. However, that never materialized, as every candidate was either inept with the bat like Hector Ortiz and Mike Tonis, viewed as unable to handle the defensive responsibilities like Mike Sweeney, or, in the case of Gregg Zaun, just wasn’t appreciated enough by the organization. The only player who stuck for a considerable amount of time was Brent Mayne, who earned more than $6 million and posted roughly a .610 OPS during his second go-around with the club. The past seven years definitely haven’t been good to Kansas City catchers, so the Royals are hoping that John Buck will place a stranglehold on the position for the foreseeable future. Acquired along with third baseman Mark Teahen and pitcher Mike Wood for Carlos Beltran in 2004, Buck has shown periodic signs that he’s capable of being at least a league-average receiver both offensively and defensively. The Royals have praised his work ethic and prevalent leadership skills, but undoubtedly want to see him take the next step towards becoming a better on-field player and, perhaps, team captain after Sweeney’s playing days are over. Doing so starts with becoming more dependable on a day-to-day basis. To date, the only dependability Buck’s brought to the table has been his defense and handling of the pitching staff, which is all the Royals initially asked of him after bringing him to the Major Leagues immediately after the trade. In a little over 1550 innings behind the plate, Buck’s committed only six errors and 10 passed balls, testaments to his very fine technique in blocking balls in the dirt. He’s no Mike Matheny, but is very, very good in his own right. Additionally, Buck worked very hard at shortening his release when attempting to throw out a basestealer, and threw out 34.1 percent of those trying to steal against him, a seven percent increase from 2004. Encouraging? Sure, but only before you take into consideration his strikeout-to-walk ratio, which is actually worse in September (6.33-to-1) than it is from April to August (4-to-1). As a general rule, any time a player’s power spikes, it should be because he’s being more selective at the plate. That definitely doesn’t apply to Buck, whose poor pitch recognition skills haven’t get better as the seasons have worn on. As a result, his liking to late-season hitting is very difficult to explain. All I know is that he won’t keep it up until he can distinguish between a hittable slider and an in-the-dirt slider. Hitting a baseball is the most difficult thing to do in sports, and that’s why those who do it with such great consistency are a pleasure to watch. It’s an art form. In my mind, a hitter understanding how the pitcher is trying to get him out is a prerequisite to long-term success. It’s about making adjustments. Quite simply, pitchers have adjusted their approach towards Buck after the first plate appearance, and John hasn’t adjusted back. If the light ever comes on and he can maintain that .750ish OPS pace after his first time up, he’ll be a more-than-adequate starting catcher. In the end, it’s time for John Buck to step it up and become more refined in his hitting approach. The strength is there, but it has to be supplemented with better knowledge and understanding of what he’s doing at the plate. If that happens, I wouldn’t be surprised if Buck’s career mirrors Macfarlane’s. Despite already having a future backup catcher in Paul Phillips on the 40-man roster, Royals GM Allard Baird wanted a veteran to serve as a mentor to Buck in 2006, desiring to achieve something similar to the effect Terry Steinbach had on a young A.J. Pierzynski with Minnesota in 1998 and 1999. According to Baird, the plan of attack would be to have the veteran’s playing time gradually scaled back as the season progresses, presumably easing Buck into a spot where he’s more comfortable playing every day. Initially, that search looked like it would have a very positive end when Baird had a handshake agreement with free agent Todd Pratt, but that fell through when Pratt reneged on the deal to join the Braves. Pratt’s long been among the best offensive catchers in the game, posting a .753 OPS over parts of 13 seasons. Even at age 39, he’d likely be more productive than the starting backstops for most teams. After a guy like Pratt is off the board, the free agent market for reserve catchers becomes like a grab bag: every player available is of a “defense-first mindset” and is “good working with young pitchers,” which is code for “None of ‘em can hit.” Baird settled on Paul Bako, a 33-year-old journeyman whose claim to fame is being Greg Maddux’s personal catcher for two seasons, one in Atlanta and one with the Cubs. Beyond that, he really hasn’t done much with the exception of making more than $4 million to get to call himself a baseball player and catch once a week, almost always on a sunny Sunday afternoon. Bako probably won’t hurt the Royals any as long as he doesn’t get many chances to hit. In essence, the Royals are going to pay him $750,000 this year to be a positive example for Buck. With a capable younger guy like Phillips already on the roster, that could easily be considered a questionable use of resources for a small-market club, but the reality is that it just doesn’t matter. He’ll be on the roster for a year and move on to another team in 2007. If Buck is better for taking Bako’s advice, the goal of the acquisition will have been accomplished. Does PECOTA or ZIPS take into account break-out seasons by young players who have projected to have far better seasons than they have had? If you put Teahen's numbers into your equation, wouldn't his be pretty close to what he produced in 2005? Many believe capable of a much higher average and alot more HR's. It seems like those type of stats are best suited for established major leaguers who have 5+ years in. Just my opinion. Does PECOTA or ZIPS take into account break-out seasons by young players who have projected to have far better seasons than they have had? Yes, I can say for certain that PECOTA absolutely does. In fact, the PECOTA system stretches far beyond scientifically projecting a player's hitting triumverate (AVG/OBP/SLG); it delves into the percentage chance that a player will "break out" or "collapse." However, you have to be careful when taking into account a projection for a player like Mark Teahen. Because his history IS so limited and, thus far, unsuccessful, it's far easier for him to show a massive improvement than it is for a guy who's already closer to his peak performance like Ryan Howard. Neither PECOTA or ZiPS is expecting a big improvement out of Teahen, which I happen to think is a little foolish. We all saw what Mark's capable of last September. The lesson here is to take these two systems with a grain of salt. Ultimately, all they do is compare the player's track record to those of similar ballplayers at similar ages, and form an expected line of performance. It's very rough, but some kind of science and organization beats the heck out of guessing. Bako is the type of ballplayer that makes me think I could be a major leaguer. I'm relatively certain I could bat .200 with seven RBI a year. Did PECOTA get its name from Bill? 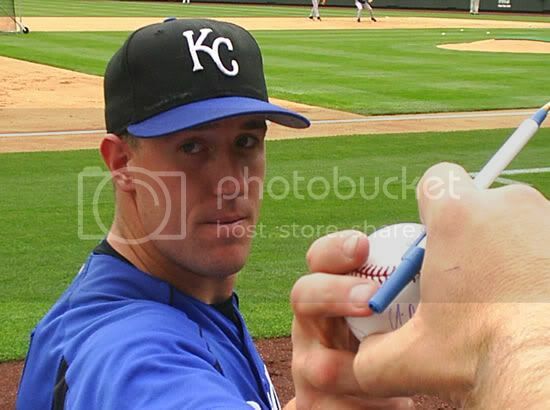 Bako is a poor man's Brent Mayne and therefore should never take at-bats away from Buck as the Royals try to move towards a competitive 2007 campaign. IF Bako spent two seasons as Maddux's personal catcher, AND Grienke is indeed a young Maddux, SHOULDN'T Bako be Grienke's personal catcher and help to show Grienke the type of game-plan Maddux would employ? I'm sick of the "Buck has to catch Grienke because they're both big keys to our future" the Royals employ. Let's let both players develop and when they both know fully what they are trying to accomplish, then let them work together. Keep up the good work Kevin, you're a nice addition to the best Royals fan site in the WORLD!! Do you hear me Rob and Rany? I love Rob and Rany's expertise, but I'm a Royals junkie and nobody gives me my fix quite like the ROYALS CORNER. I'm not sure how they came about this, but PECOTA stands for Pitcher Empirical Comparison and Optimization Test Algorithim. The fact that it spells out the last name of former Royals great Bill Pecota is probably just happenstance, but knowing how crazy the dudes at Prospectus are, I wouldn't be surprised if they did it on purpose. The exception however should be to become Zach Grienke's personal catcher. Really interesting point, Brian, one that I hadn't thought of. Although Maddux was definitely the brains behind the operation, Bako probably knows a few tricks that could help Greinke or any other pitcher on the staff. Appreciated on so many levels, man. And just as a heads-up, if you liked today's RC content, you definitely don't want to miss what we have ready for tomorrow. Trust me, it's gonna be freakin' sweet. I WANT DAVE BACK!!!LOL! !JK JK, good job Kevin! I look forward to reading your content on royalscorner.com. That's taking nothing away from Dave, though. With Phillips age, I'm really surprised the Royals wouldn't give him as big of a chance as possible to show what he can do. Because if Buck starts of 2006 the same way he did 2005, a contingency plan must be made, and for the immediate future one would have to think Phillips rather than Bako. Phillips is in his prime, but his lack of ML plate appearances could still yield some surprising results should he get the playing time. With Bako, this is simply not possible. Again, short-sightedness, and an unwillingness to commit to the path of youth and future in the face of what will obviously be a 2006 that is well-nigh as challenging as 2005. Bako is not the way of improvement now or in the future -- Phillips just might be.